What image is the UK projecting to the world? The more I read about the way the Government and Home Office are handling the ‘Windrush scandal’ surrounding the children of Commonwealth citizens that came to Britain In the 1960s, the more I despair of this country’s reputation. Channel 4 news have been highlighting the problem since January. This report is (quite frankly) disgusting. People who’ve lived here for decades and thought they had the absolute right to do so are being treated appallingly. Some may even have been deported illegally, the Home Office doesn’t know and can’t be bothered to find out as it would cost too much money! This is only part of the problem. The other part is the plight of the EU citizens caught in limbo following the Brexit referendum. There’s about 3.5 million of them. They’ve no idea what the future holds for them as no-one has a clue what the outcome of negotiations will be. Many are already leaving due to the uncertainty and the increasing hostility towards them, not just from ordinary people but authorities like the Home Office, which by any reasonable take seems at best incompetent and at worst, to be pursuing a deliberate policy of intimidation. We shouldn’t be surprised really, who was the Home Secretary at the time policy was changed and the poisonous atmosphere towards people from other shores began to manifest itself? Step forward our current Prime Minister, Teresa May. Her culpability is explained in this very good comment piece in the London Evening Standard, where former Chancellor George Osborne is enjoying the opportunity to settle a few old scores! Of course, all of these problems aren’t just reported in the UK media, they’re reported around the world. Teresa May’s stupid refusal to meet Caribbean heads of state to discuss the matter has been reported too – as was her climb down and apology. But it’s too late, the damage to the UK’s reputation’s been done. It’s not just the media that’s spreading the word either. Every person who’s returned to their country of origin after suffering bigotry and hostility will be telling people too. Our reputation as a decent, tolerant, welcoming country is being trashed. What was our national broadcasters response to all this? On Saturday it broadcast (in full, for the first time) Enoch Powell’s infamous ‘Rivers of blood’ speech (despite widespread criticism) making matters worse, not better. Bigotry and intolerance is fashionable again. It makes me so, so angry. The situation’s not going to get any better. The bigots are in charge now, both on the streets and in Government. Brexit will continue to make things worse as the shambles will continue – with the added attraction of the scandal of Cambridge Analytica, UKIP and the Leave campaign ‘buying’ the referendum result. Later, after writing this, came the latest revelation. That the Home Office (under Teresa May) destroyed the landing cards of 1000s of Windrush arrivals that had been kept safe for decades. Then, when people enquired, told them that no official records of their arrival existed! No, they wouldn’t – you went and bloody destroyed them! I fear for the future of my country. What on earth have we become? The anti Hs2 campaign has shares in green ink. Well, if they had any sense they would, but sense is the one thing noticeably absent from the anti Hs2 mobs social media campaign nowadays. It’s become the modern refuge for and version of the old green ink brigade! (here’s an explanation of the term for readers who may be unfamiliar with it). In fact, it’s the green ink brigade who seem to be keeping the antis social media campaign (and I use that term very loosely) going. More and more of the old campaigners have left the field nowadays. This is due to a combination of factors. One is that many of them have been bought out by Hs2 Ltd & moved on (metaphorically and literally). Another is that most sensible people have worked out that it’s futile. There was a noticeable drop off in their campaign after the Hs2 Hybrid Bill passed with a massive majority and another after last years general election when it was clear the political battle was lost. As the pragmatists and rational folks have retired, the – how shall I put this? “eccentric” wing have taken taken centre stage. In a few cases they’ve been bolstered by folks who don’t just write in green but prefer the most vivid shades of the colour! They’re a mix of UKIP members, who bring their own particular brand of xenophobia, paranoia and poor education – and the genuinely bonkers. Folk who believe in any conspiracy theory going but think they’re the only one’s who really know the truth. It’s like an internet version of Bedlam, only without the restraints. To say this leaves their campaign with a image problem is an understatement. If I was Hs2aa or any of the few intellectual Nimbys left, I’d be tearing my hair out at their behaviour as it’s utterly destroyed any credibility they might have claimed to have. It also makes it very easy for politicians to ignore them. When you see some of their tweets and Facebook comments, it’s not difficult to see why. So, here’s a selection of the anti Hs2 social media car crash. Enjoy! Crazy anti Hs2 campaigner of the week No 17. Such distasteful claims only go to show how desperate & divorced from reality the anti hs2 mob are as it becomes clear their campaign’s failed. But it also shows many of them have become indivisible from UKIP – who jumped on the anti Hs2 bandwagon after the 2010 election in the hope there’d be votes in it. 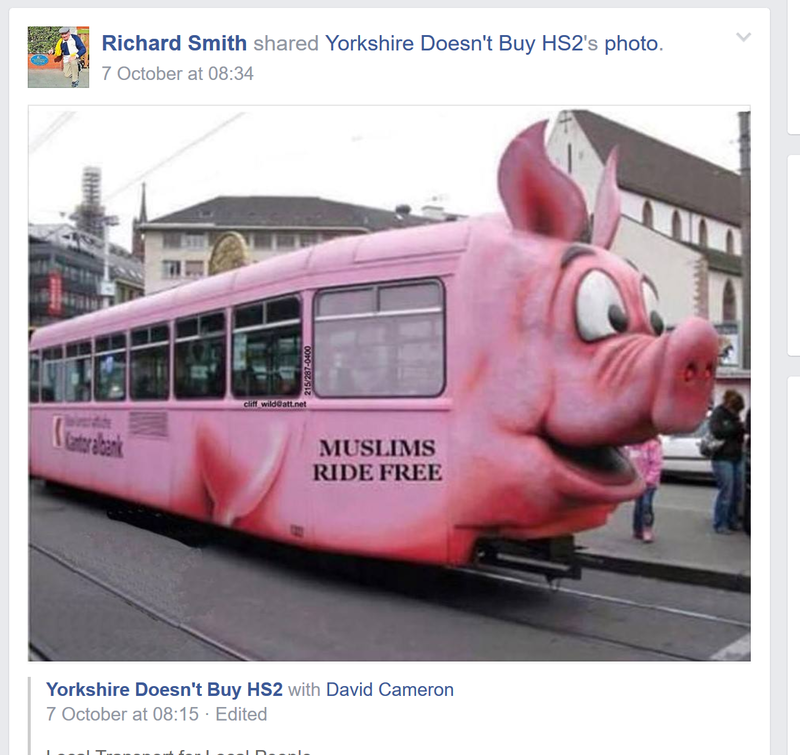 Anti Hs2 campaigners have never been afraid to use homophobia, racism, threats or intimidation. Now they show they’re not afraid to play the religious card either. Here’s another of today’s examples, from UKIP fan Trevor Forrester which also manages to combine religion and racism. Trump trumps the anti Hs2 mob. Nowadays the anti Hs2 campaign provides more comedy gold than it does a credible threat that can stophs2. The past 24 hours have provided yet another example of that, as well as a lesson in how not to use social media. Since May 2014 there’s been an anti Hs2 Tweetbot in town with the laughable moniker of ‘Hs2Facts’. It’s laughable because facts are in short supply – although there’s unintentional humour in abundance. This particular tweetbot started a poll, asking folk to register their Yes/No votes on Hs2. Like much of the anti’s social media campaign – all it’s done is shoot them in the foot. After 18 months the result is? A grand total of 220 no votes. To make it even more delicious the twitter names are displayed – so straight away you can see it’s all the usual suspects. It puts the anti Hs2 mob claims of support into perspective, doesn’t it? Remember, these same nutters once claimed that their protest was bigger than the one against the poll tax! This unpleasant little group group appears to be run by UKIP supporters. Of course UKIP have been heavily involved with the StopHs2 campaign as (cynically) they saw it as a way of snatching votes. UKIP dropped its 2010 manifesto pledge to build three high-speed rail lines as they’d been conned by the anti Hs2 campaign into believing there was mass opposition to Hs2 & so lots of votes to harvest by opposing Hs2. Of course, the reality was very different & UKIP failed to gain a single seat in any area that Hs2 will pass through. Despite the general election humiliation, it’s clear UKIP & the StopHs2 campaign are still working together through groups like this. Not that it’s doing them much good, this Yorkshire group only has around 250 followers. Truth be told, there’s bugger all opposition to Hs2 in Yorkshire. There’s only a couple of anti ‘action’ groups in the county, neither of which are very active. Rather typically, when I drew attention to this bigoted nonsense there was a deafening silence from anti Hs2 campaigners. Not a single one condemned it. Instead, one of the usual suspects (fond of resorting to bigotry himself) tried to accuse me of faking it, which is rather stupid when the post is still displayed on this groups Facebook page for all to see!